On a weekend with both the Bassmaster Elite Pro Series and the FLW Tournament Series, it is hard to keep track of the weigh ins with our Rod Glove Pro Bass Elites and FLW Touring Pros. 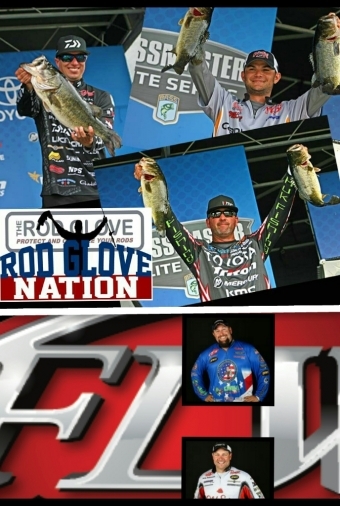 The Rod Glove is proud to be represented at these great events and the Bassmaster Elite Series is for the highest level of professional bass fishing. In order to compete in this series, one must compete through the Bassmaster Opens of the BASS Nation. For those anglers that are already on the Elite Series, they must re-qualify each year by maintaining points throughout the season. This season will bring 111 anglers to the field for the 2016 season and there will be a series of nine tournaments plus a Classic Bracket event. The Bassmaster Pro Elite Series was founded in 2006 and was formerly known as the Bassmaster Tour, Top 150 and Top 100. With one of the largest fishing tournaments just ending, the Bassmaster Classic, attention is now kept on the anglers to see who will regain strength or rise from the bottom. The Bassmaster Elite Pro Series tournament this weekend is at St. John's River, Palatka, Florida and The Rod Glove Pro Bass Elites competing include Gerald Swindle, Randy Howell, Jordan Lee, Jason Williamson and Chad Morgenthaler. The end prize is not only points for the angler to qualify for the 2017 Geico Bassmaster Classic but also $100,000 to the angler with the most weight. FLW, is the premier tournament fishing organization and has seen growth and change with its tournaments when Irwin L. Jacobs purchased this and renamed it after Forrest L. Wood, the founder of Ranger Boats. It has since become one of the most lucrative bass tournament circuits -known as the FLW Tour. Competitors in this circuit must qualify in order to advance to the next level of competition with larger payout amounts. This weekend the tournament series is at Lake Hartwell, South Carolina and The Rod Glove FLW Touring Pros include both Greg Bohannan and Joe Holland. The final tournament of the season is the FLW Cup and this year that will be in August at Huntsville, Alabama where competitors will try to take home not only the prestigious Cup but also $100,000. The Rod Glove is proud to have both Pro Bass Elites and FLW Touring Pros at both of these tournament series and all of them use the Rod Glove products to protect their investments of rods, reels and gear while travelling during these events. Whichever fishing tournament series that you may prefer, check out www.bassmaster.com or www.flwfishing.com to follow the weigh in and live coverage each day.